There is much to consider (re-consider?) when mastering the B2B customer journey, especially in companies with established sales development processes. Why? Because, when sales and marketing departments are mal-aligned and at cross-purpose, things go awry in a hurry. Mastering B2B sales and marketing helps straighten out the customer journey from a zig-zag, discombobulated mess. When these two forces work against each other, or at least have their own agendas, it’s the customer that suffers. Marketing and sales need to be one, united force for conversion, and not two islands in an ocean of confusion. The lack of understanding of clear roles is often the case, so it’s leadership’s responsibility to stay abreast of possible troubles between the two, and keep conversion rates at or above expectations. The role of marketing is to reach prospective clients that match their goals and objectives. Sales’ responsibility is to convert those prospects into paying clients. Unless these two somewhat disparate groups are synchronized and “on the same page” things will have a tendency to waffle, even fail. If sales and marketing are separate departments, or even if they operate in separate space within the firm with individual management, it’s beyond time to unite them under one banner. When one works apart from the other, sales’ expectations won’t match unified goals that marketing is expected to achieve. To expedite the B2B customer journey, they need to function as one team to fully adopt the goals and objectives, speak the same language, and be evaluated on combined criteria. Marketing is required to attract ideal prospects. Sales is responsible for converting them into revenue dollars. However, often work under misunderstood objectives. When goals and objectives are united, these teams must rely on a common objective rather than sales quotas, lead generation targets, and bottom line revenues. However, often not understood is that one must depend upon the other to meet objectives. Marketing goals and objectives are to supply sufficient qualified leads to the sales department. Sales is to convert sufficient of these leads to meet their revenue objectives. Automatically they are focused on two different targets. Qualified leads that lead to Sales Revenues (conversion rates) should rise from the existing percentage (conversion divided by qualified leads) to a higher percentage. That way both parties are responsible for success. It does no one any value pointing fingers for missed targeted revenues. It’s imperative that the true definitions of what makes for a qualified lead, and acceptable time frame for conversion, how many leads per period must be delivered, and the expected closing rate. Marketing must determine how many qualified leads (a mutual definition) need to be presented to their sales compatriots in order to reach the proper conversion and revenue goals. Identifying all of the responsibilities of each sector will help clarify what the expectations are, and the agreed to set of parameters like time, value of the lead, opportunities for closing, etc. One of the great customer journey ideas that recently came from a sales and marketing conference I attended was the development of a partnership between members of both sales and marketing teams to generate topic ideas for upcoming marketing assets. By coming up with agreed-to blog articles, videos, sales demo scripting, podcast joint discussions, brochures and direct mail pieces, and whatever else might be utilized. In that way they must discuss how and why these ideas might advance either marketing’s awareness of how prospective customers can make it through the buyer’s journey. They also will learn how marketing benefits sales through the design and creation of marketing assets and the why and where-fore of each marketing asset. This improved understanding of each other’s contributions to the revenue efforts should create a stronger bond, and therefore, greater impact on top-line revenues. 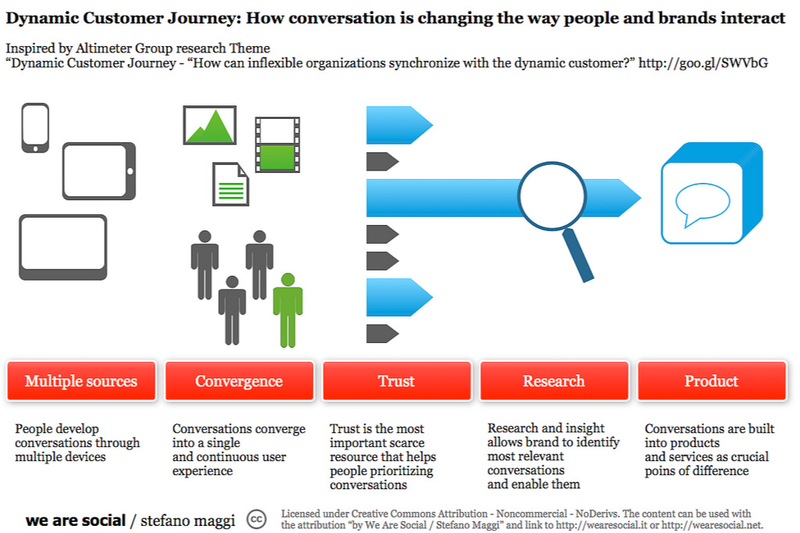 So you now realize the B2B customer journey is extensive. This is obviously not a complete list, but it is a good start on building a cohesive new team out of two with separate agendas. By combining both forces with common objectives, productivity increases, moral and esprit de corps rise significantly. What’s The Best First Step? Sometimes the winning solution starts with just a conversation. Use the form here to introduce yourself and your company. Laura will reach out to you very shortly, calendar in hand, so you can schedule a call or arrange a meeting. Laura has found that by scheduling a call, a more productive session can be accomplished. There are fewer interruptions and everyone can stay focused on great questions and honest answers. It is very common for an initial call to result in a measurable benefit that the business owner or sales manager can implement into their sales process.